Samsung might be the biggest smartphone maker globally, but it's still hankering after that elusive emotion - love. Even though the brand sold the most smartphones last year, according to Gartner, beating Apple, Huawei and Lenovo, the brand doesn’t inspire the kind of fanaticism that certain rivals enjoy. Speaking to Marketing at Mobile World Congress, Samsung’s vice-president of corporate marketing in the UK, Russell Taylor, said this is the year it will turn that around. He pointed to Samsung’s ‘Unpacked’ press event at Mobile World Congress, during which the company unveiled a roster of mobile products that work together, including the new Samsung Galaxy S7 and S7 Edge phones and the Gear 360 camera. He said: "In previous years, you would have seen [us say], ‘here’s a new phone, it’s 20% better and we’ve focused on the four features people care about the most’. "What you saw [this week] was a different way of talking about what we do." Specifically, Samsung laid out a Gear VR virtual reality headset in each of the 5,000 seats at its press conference, demoing the new phones up close. It also unveiled the Gear 360, a 360-degree camera that allows consumers to shoot video for VR in extremely high definition. The new camera can stream directly to Samsung’s new phones, and the brand plans to give away a Gear VR headset with every S7 and S7 Edge purchase. Yoking the four devices together as a mobile ecosystem marks something of a first for Samsung – and that’s a clue to how the brand plans to tell its story. Taylor pointed to the brand film which played at the start of the keynote, which highlighted Samsung’s long history of firsts, like producing the first smartwatch in in 1999. "The genuinely interesting thing for us is, Samsung is a huge brand," he said. "Consumers know us and love us because we’re a leading TV brand and in the kitchen. We’re hugely successful. But if you talk to consumers, they can tell you about the products they own, but not the story of the brand. "It’s almost incredible, given our size, that even our most devout fans can’t say too much about it." While Taylor won’t go into details, he spoke about plans to talk up the brand’s heritage and, perhaps, its Korean roots. "What you’ll see is a shift now in the way in which we tell our story, so it’ll no longer be just a list of product features," he said. "Have we told our story so we connect with people emotionally? You’d have to have to say no," he added. "We’ve made great strides in last couple of years, but this is the year we ratchet it up and start winning the emotional story." This is likely to be an expensive year for Samsung, which will not only have to budget for its new device launches, but the arrival of Samsung Pay in the UK and its sponsorship of the Olympics. 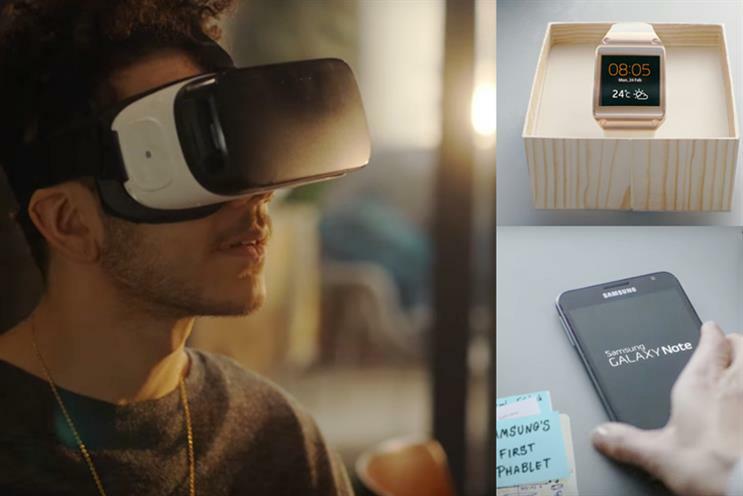 Last year, the brand spent £37.8m on above-the-line media, up slightly from £34.9m in 2014, according to Nielsen. Money, of course, is not an issue for the Korean brand. "Samsung is not in a position where the determining factor of what we do is the amount of money we spend," says Taylor. "We’re a hugely successful brand, and we have a responsibility to grow some of the categories that are starting to reach levels of maturity." Like smartphones, for example, which saw their lowest growth rate globally since 2008, by Gartner’s reckoning. But Taylor added that the brand’s marketing dollars "work hard", pointing to the efficacy of its unofficial Rugby World Cup campaign, which not only shifted more Galaxy S6 devices, but boosted the brand’s standing among Brits. The campaign starred Jack Whitehall and saw the comedian attempt to take on rugby stalwarts like Martin Johnson and Lawrence Dallaglio. The brand has "great plans" for the Olympics, Taylor said, though he gave no further detail. He said: "This is a year full of activity rooted around a brand story we’ve not managed to tell people so far, anchored around great products with the phone at the centre."